This was the very first painting I ever did. It was a plant sitting on my kitchen table; I filled a little pot with water, squeezed some watercolors from tubes into a plastic dish ~ watercolors I’d bought with a 30th birthday gift certificate to an art store. I sharpened a pencil, sat down in front of this geranium and started drawing. 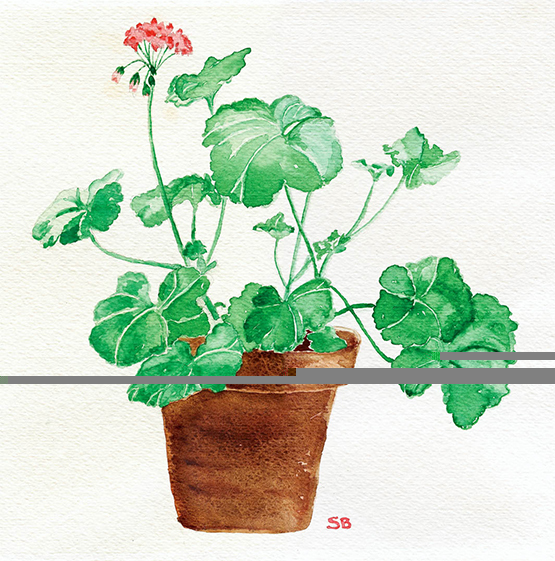 "Geranium" is a 10 3/4" x 10 3/4" Giclee for an edition size of 750. This fine art print is color matched and personally approved to attain a print that faithfully captures the color and feel of my original watercolor. It's printed in the USA on acid free, beautifully textured, archival quality paper, using archival pigmented inks. "Geranium" is hand-signed and numbered and comes with a Certificate of Authenticity. We did our very best to make sure this is something you will treasure for a lifetime. We're showing you this painting as I have it framed, just so you can see what it looks like, but these will come to you unframed. That way you can get the frame and mat you like that goes with your own decor. I also love the thin gold frames, and have tried the mixed gold and silver too, and they all look good. We send our Giclees in acid-free packaging for long time archival storage. To find out more about the Giclee process, you can go to: www.susanbranch.com/shopping/gicleedescription.html.